Did you know that the words "pray" and "prayer" appear in the Bible anywhere from 450 to 600 times (depending on the translation you're reading)? And there are over 650 prayers recorded in the Bible! Obviously prayer is an important part of our walk with the Lord. This year, I am striving to be more intentional in my prayer time, especially in taking time to pray for others. I have found that praying for others, whether it's our family members, friends, church leaders, neighbors, or political leaders and missionaries we've never met, helps us draw closer to the Lord and to those individuals. Praying for our enemies changes our perspective and opens our hearts to show more love and kindness to those around us. Prayer is such a powerful way for us to grow in our relationship with the Lord and with others! However, I've also found that I have a tendency to fall back into the habit of simply praying for the things that I want or need, like offering up a list I'm asking the Lord to check off. 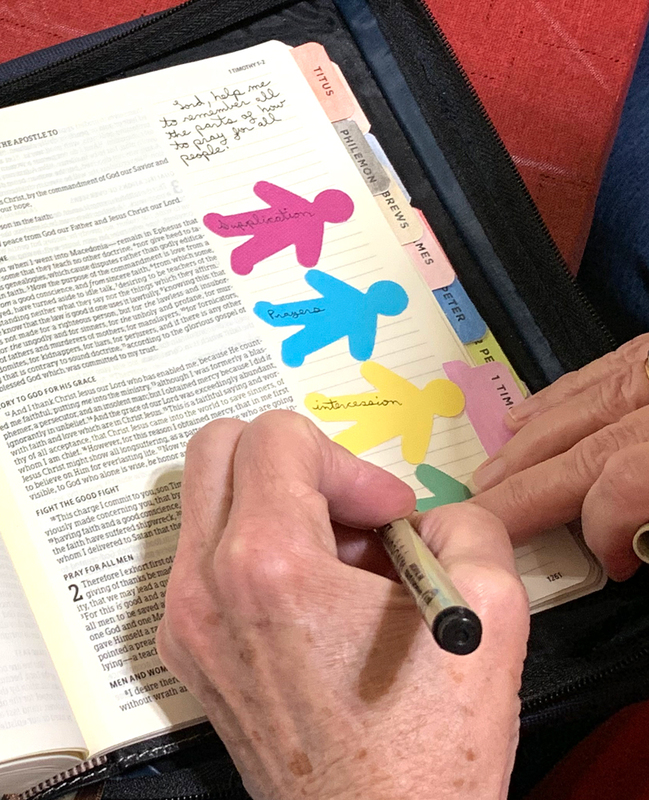 I know I'm not the only one who does this because several others in my Pray Without Ceasing Bible Journaling classes last month admitted to the same practice at times. Yet, we all truly desire to spend time in prayer for our families, for our friends, for our neighbors, for our country, for our world, etc. Over the years, I've used a variety of practical tools to help me be more intentional with my prayers. 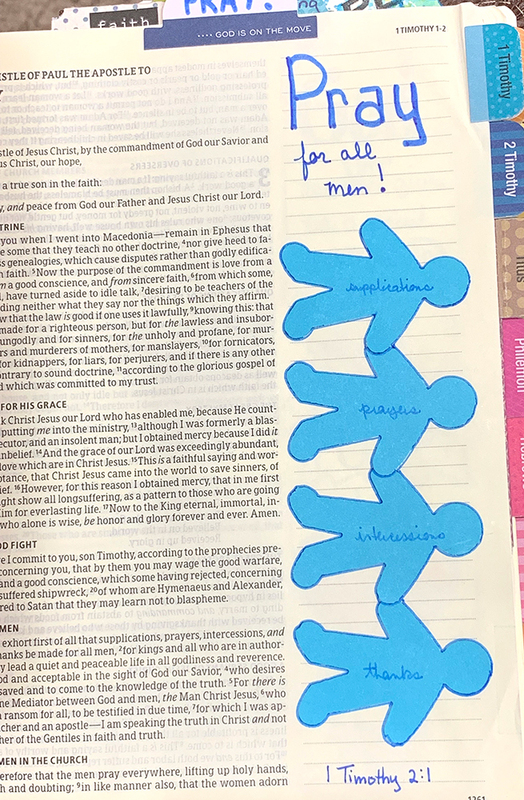 I've written out my prayers, used several prayer journals (like this fun creative guided journal), created notebooks with sections for various prayer requests, and most recently used illustrations in my Bible as reminders to pray. 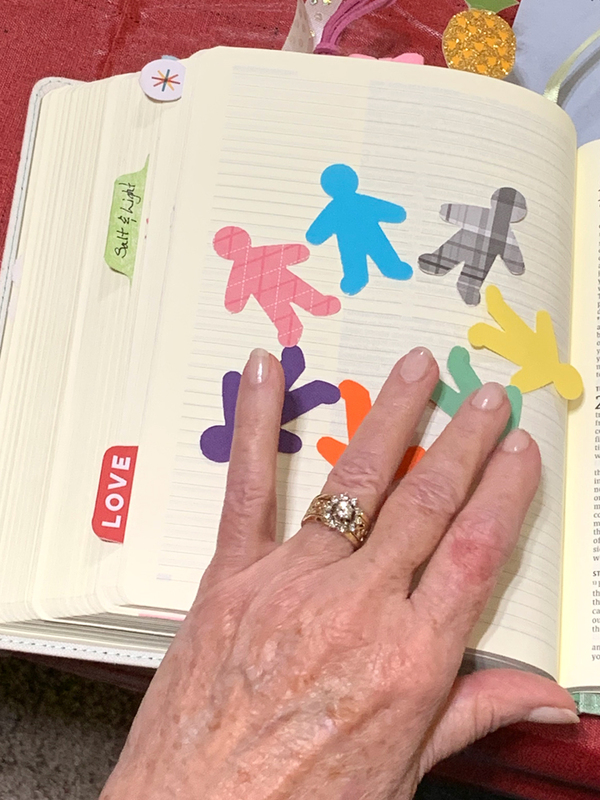 In the Bible journaling class last month, we created prayer circles in our Bibles using "people" I punched from cardstock or patterned paper. I created this prayer circle in my Interleaved Bible so I would have the full page to work with. 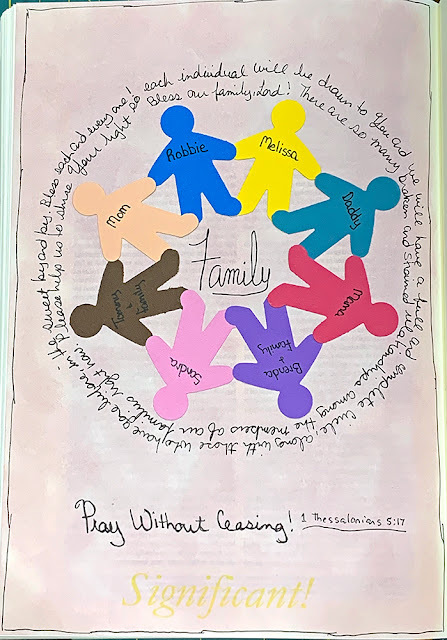 Some of the ladies added their prayer circle to a blank journal page or one of the blank pages that can sometimes be found at the end/beginning of a book in their journaling Bibles. In addition to creating prayer circles, we added prayer chains beside 1 Timothy 2:1 as a reminder to include supplications (petitions), prayers (worship), intercessions, and thanks in our prayers for everyone. We also took time to simply journal our prayers. What a privilege to sit around the table with a group of women striving to draw closer to the Lord through prayer. Truly, what a privilege it is to carry everything to God in prayer! What tools do you use to be more intentional in your prayer time? I like your prayer people circle.